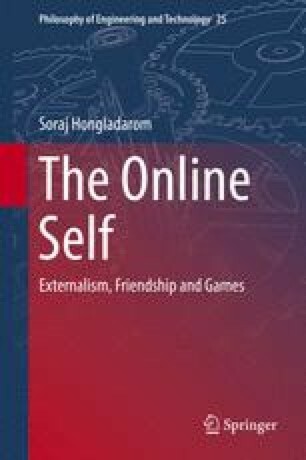 The last chapter is about the online self in computer games. The self appears most often as the avatar, a Sanskrit term meaning “to come down.” This is referred to a god, in most cases the god Vishnu, Preserver of the Cosmos, coming down and taking human or animal forms in order to fight against the evil that is bent on destroying the cosmic order. A key issue here is the relation between the game player and her avatar. Is the avatar mere “cursor” that responds to the command of the user in her navigating the terrain in the game and nothing more? Or does the avatar take a life of her own, so to speak, when she participates in the world of the game? My argument is that, according to the Extended Self View, the situation of how to account for the player and her avatar should be understood as there being two selves, one belonging to the player in this world, and the other belonging to the avatar in the game world, where these two selves are extensions of each other, but are also distinct from each other.